The snow blows fiercely into my face as I hold the plastic angel. Dad tells me to lift it higher, but my siblings disagree. We’ve been setting up our lawn nativity scene for almost an hour. It started with Dad announcing it was time to put up the manger scene. Collectively, we all groaned, but grudgingly put on our coats and gloves. Dad retrieved the ladder and handed the figures down from their spot in the garage rafters. After they had been collected on the lawn, the arguments began. “Jesus shouldn’t be put here, no, Mary can’t go there, and who put St. Joseph over there?” We go around and around, but we finally get it up. We’re not the only ones who do this. Christmas rolls around, and suddenly, nativity scenes are everywhere. They’re set up outside every Church and in the window of shops. We may not even notice them anymore, they’ve become such a familiar sight. But where did they come from? Who thought of recreating that holy night in Bethlehem two thousand years ago? In the year 1223, St. Francis was traveling to the Italian village of Grecio to celebrate Christmas. Once he arrived, he realized the monastery he had planned to use for Midnight Mass would be too small to host the large number of villagers coming. Francis concluded the Mass must be held outdoors, and that gave him an idea. After receiving permission from Pope Honorius III, he gathered an ox, a donkey, and a manger and found a suitable cave in the hilly countryside. He set up the manger, placed the animals near it, and recreated the Christ Child’s birth. On Christmas Eve, the curious villagers made their way to Francis’ cave to see what he had been working on. They were greeted with a sight that astounded them. Soft candlelight illuminated the simple reenactment of Bethlehem. Francis began Midnight Mass and preached about the simple poverty of the stable in Bethlehem. He became so overwhelmed with love for the Infant, he couldn’t even utter the name Jesus, instead calling Him, “the Babe of Bethlehem.” He pleaded for the end of the rampant greed in the villagers’ lives, especially around Christmas, and pointed to the simple poverty into which the Babe had been born. The villagers’ hearts were powerfully moved. During the sermon, one of the villagers reported he saw “an Infant marvelously beautiful, sleeping in the manger.” Once the Mass concluded, Francis stopped his brothers from removing the straw from the manger. Many legends have emerged telling of animals eating the straw and being cured from their diseases. The villagers circulated the news, and the fame of St. Francis of Assisi’s simple nativity scene spread rapidly. Soon, every church in Italy displayed their own living nativity scenes. Christians from around the world visited these living nativity scenes to pray. 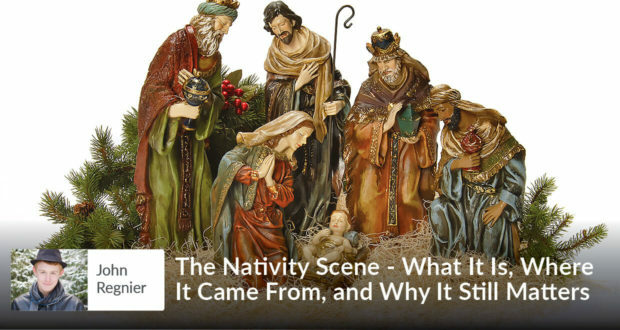 The nativity scene became a reminder of the real reason of Christmas. Eventually, people made statues of the living nativity scenes. The figures were often carved of wood or wax and dressed in colorful clothes. More characters were added, such as Mary, Joseph, and the Three Kings. The scene evolved over the ages, with different countries and cultures adding their own figures and traditions. In France, painted figurines made of terracotta, called “santons,” are very popular today. Germans developed a tradition, where the baby Jesus is only displayed in the manger after Christmas Eve to draw attention to His holy birth. They prepare mangers for the Infant King and allow children to place a piece of yarn in the manger each time they do something nice. Polish “szopkain” include historical buildings in the background of the nativity scenes. Countries all around the world embraced this holy custom and strove to live the simple poverty of the Infant Jesus. That surprised me. I had grown up with nativity scenes and never once thought of them as anything other than a decoration. I had always helped set up our lawn nativity scene. My family had one or two large statue sets in our living room, and my siblings and I even had our own personal sets to which our godparents added each Christmas. But, I had been looking at the nativity scene all wrong, and maybe you have too. Maybe we lose sight of the meaning of Christmas and get caught up in the presents and lights. Perhaps all we can see are the physical things right in front of us, instead of the reason behind them. I had looked at a nativity set and seen it for its material things, a bunch of lovely statues gathered around a baby. I missed the real gift. The nativity scene is not just another pretty thing to look at around Christmastime. It’s supposed to remind and inspire us to turn away from the greed constantly plaguing our world and to contemplate the amazing love God has for us. The nativity scene is a steady reminder of the real meaning of Christmas in a world trying desperately to forget. When the nativity sets come out this year, I will pause for a moment and look for the real meaning behind the characters. I will watch the shepherds and imagine their joy as they become the first to worship the Infant King. I will gaze upon the Wise Men as they lay down their pride and bow to someone greater them themselves. I will contemplate Mary and Joseph as they look with incredible love on their precious Son. And I will really see the Babe in the center of it all and think of the unimaginable love He has for me. An avid reader and prolific writer, John is smack dab in the middle of seven children. As a junior, he is busy taking college prep tests and trying to figure out what he wants to do with his life. He recently completed a 50,000 word novel for National Novel Writer’s Month this past November. John is very musical and loves to play the piano and sing in the church choir.